Save Ignatius Flaccus from his own robots. Break into Ignacius Flaccus' House. Find Ignatius Flaccus hiding in his basement. Return to Ignatius for your reward. 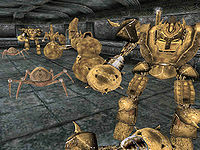 Return to the Robot Arena a few days after completing the Dwemer Warbot quest and talk to Ignatius Flaccus (or just enter and exit his house once more and then go speak to the woman mentioned below). He will say you have already seen it and won your money (unless you lost, of course). Leave the building and go towards the gate to the Temple. A woman by the name of Venasa Sarano wandering around the gate will mention the Robot Arena. Talk to her and she will tell you that the door is locked and there are noises from inside. Go back and sure enough a lock is on the door. Pick the lock and go downstairs; the containment field is gone, and Ignatius is hiding from his Dwemer robot behind the table in the corner. He asks you to disable the robots for him, which shouldn't prove to be too hard; it is just a few Centurion Spheres, Centurion Spiders, and Steam Centurions. Return to Ignatius for your reward. Unfortunately, you can no longer bet on battles between the centurions. 1 I met a woman today by the name of Venasa Sarano, an avowed fan of Ignatius Flaccus' Robot Arena. She states that the last time she went by his house, no one answered, and strange noises emanated from inside. Perhaps it's worth investigating. 10 I found Ignatius hiding in a room in his basement. His house is overrun with Dwemer battlebots, all very hostile. He says he will reward me if I can 'disable' them all for him. 20 Finishes quest I have disabled all of the Dwemer bots, and been rewarded by Ignatius. This page was last modified on 2 March 2018, at 11:36.